The news came at the Governor Meets the Press conference held at Phuket Provincial Hall this morning. “Due to the rapid economic expansion in Phuket, the construction of buildings, notably condominium housing, has been quickly done without urban planning,” Governor Norraphat Plodthong admitted today. 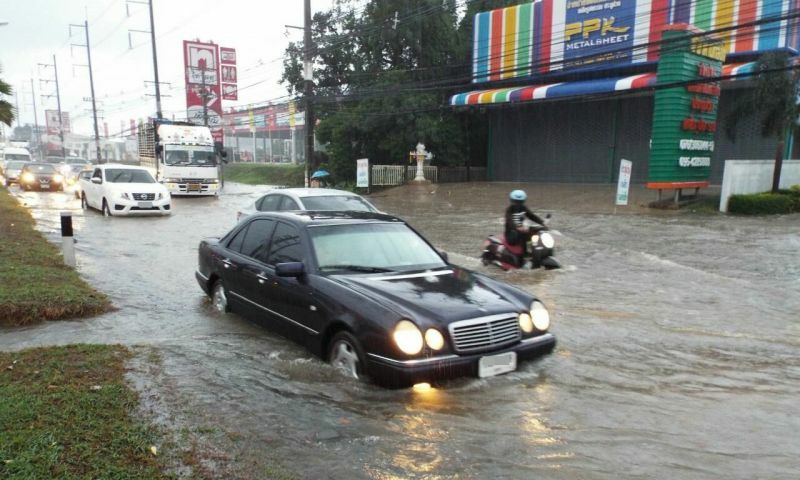 “Floods in many areas have happened, which results in a bad image of Phuket. Tourists lack confidence, traffic jams become a major problem for the province,” he said, not noting that years of Patong and other areas across the island repeatedly flooding prompted the Thai media last year to denote Phuket the honourable nickname “Waterworld” in their headline stories. “Following recent problems, Phuket provincial authorities has been meeting with relevant departments to speed up the solution (to repeated flooding), targetting three areas,” the Governor added. The three areas are in front of Thalang School, for which the province has allocated a budget of B15mn; at Baan Pakrongship, with a budget of B15mn; and in front of the Thai Watsadu store on Thepkrasattri Rd, with a budget of B30mn, Gov Norraphat explained. “In addition, a support budget from the Phuket Provincial Administrative Organisation (PPAO, or OrBorJor) through its accumulated budget for 2016 has been dedicated to solve the problem at three other locations: in front of SuperCheap (B48.75mn); in front of Baan Suan Pa (B12.3mn); and in front of the Susco petrol station in Muang Mai (B30mn),” he added. Phichak Sornchana, Deputy Director of Phuket Highways Office explained at the meeting, “The Department of Highways is responsible for the first three projects, which need to be resolved urgently. “We expect to start the contracts by mid-October,” he said. "We concluded the e-bidding yesterday (Sept 17) and submitted a list of contractors to the department head office for approval,” Mr Phichak explained. “The next step is waiting for the department to deliver the budget to the Phuket provincial treasury,” he said. “We expect to have this by Oct 8, then by Oct 15 we will call the selected contractors in to finalise arrangements and sign the contracts. After that, we can start the projects,” Mr Phichak told The Phuket News after the meeting. “We will stress to all contractors that the work must be done quickly and that the effect on motorists must be as little as possible. “During the construction period of all three projects, which each will have to be completed within 120 days, the contractors must set up lights and signs to be seen clearly to prevent accidents. “During the night, the work will continue with two lanes open at the same time to be flexible for traffic, and must have four lanes open in the morning (during rush hour),” Mr Phichak said. “Also, drains will be installed on both sides of the road and then once completed the footpath must be beautiful,” he added. “In addition, we will start the work after the rainy season has ended because in the past we have found that heavy rains are a major difficulty that only causes projects to be delayed,” Mr Phichak said. The drains to be installed under Thepkrasattri Rd will be concrete frames measuring 2.1-metres cubed, he noted. “This is for better drainage and to solve the problem of repeated floods in a sustainable way,” he said. "It is well known that this road was built obstructing waterways, and the drains installed are too small, and the context of this road has changed,” Mr Phichak said. “Also, the natural areas and the trees that used to absorb the water have been cut down. The floods come so fast and more radical now, that is why we need to do this,” he added. Governor Norraphat also noted that the provincial government has set up a working team comprising officials from from seven departments and units, along with the Royal Irrigation Department, to set up rainwater measuring devices at 31 locations in high areas. “They will install sensors and a system to process the data so they can alert people (of heavy rains and impending floods) through an application,” Gov Norraphat said. “People will be able to get more information about the volume of rain that has fallen, and we can prepare for as well as prevent various disasters more effectively,” he said. It would be fairly easy to stop the problem in front of SuperCheap and it would a lot less than B48.75mn! Just put a cop by the drains and shoot everyone who throws plastic bags and polystyrene in the drainage system. Several times when it's flooded I've seen some poor soul working feverishly to collect the massive amount of trash causing the problem. Pay the cleaners a decent wage too. More than triple higher density housing/condo's/hotels is what is needed in Phuket and the sooner the better. Thai have a low profile commission system, right? Actually to govern well, you do not do important things anymore just 10 days before your successor starts to take over. You leave these things to him. Not doing so has a double bottom. Initiating things, running away, not being responsible. The governor seems to be trying hard to ink a lot of big budget deals just before his leaving Phuket. Gee, I wonder what his true motives are??? Nonsense and jibberish. This is just the next mega budget burner. The governor laments the lack of urban planning (duh), then presses on with these piecemeal and fragmented projects that will just push the problem down to the next bottleneck. No regional plan. And we will also likely see drains placed too high to work or so low they create traffic hazards and cause accidents. Hopeless case. Ahh- so it's all about 'image' then. No mention about addressing the root causes of this on-going issue.